For Digital Inclusion Week in Austin, CTN held a series of events called Tech Teach-Ins. These events match corporate volunteers with community members looking to improve their digital skills and take advantage of what their digital devices can offer. 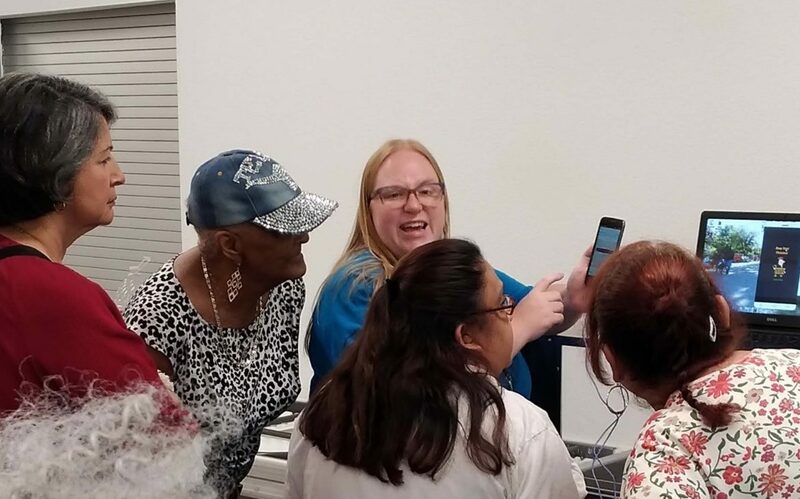 AT&T was invited to provide mobile device training to residents of North Loop Apartments, a 100-household senior property owned by the Housing Authority of the City of Austin (HACA). A dozen residents learned to use the Ride Austin app on their smartphones. The volunteers demonstrated how to use the app. Then, with one-on-one instruction, the participants downloaded the app on their own devices and shared a ride to the Black Star Co-op, where they all had lunch. CTN will continue to offer Tech Teach-In events on a monthly basis, bringing together nonprofit and corporate partners. If you represent a nonprofit or corporation in Austin and are interested in partnering on a Tech Teach-In event, please contact Jessica Looney.